Am I the only one who purposefully avoids the snack aisle at the grocery store so that I don’t accidentally eat an entire bag of potato chips in 24 hours (or in one hour, let’s be honest)? If you are going to snack, it’s best to make them at home, right? You can control the ingredients and the sodium all the while having a little fun in the kitchen with the family. Next time you start craving potato chips, try this recipe. 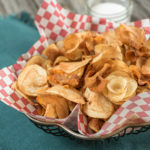 We decided to make a mixture or potato chips and sweet potato chips because we liked variation of color and flavor but you could fry a full batch of one or the other, depending on your preference. Heat oil to 375 degrees in a deep fryer. Using the ribbon disc, make potato ribbons using the 3-in-1 Spiralizer. The Test Kitchen found that potatoes can be peeled or unpeeled but it is best to peel the sweet potatoes before spiralizing. Place a single layer of potato ribbons in the deep fryer basket and fry for 1-2 minutes until the potatoes are golden brown and crisp. Lift the basket to drain the potatoes and transfer the chips to a paper towel-lined plate or tray to finish draining. We topped our homemade spiralized potato chips with coarse sea salt but you could add any of your favorite seasonings to spice up your chips. Smoked paprika, Old Bay, garlic salt or cayenne pepper would all add flavor to these crispy chips. These won’t last long so grab a bowl and serve immediately. Potatoes can be peeled or unpeeled. Peel sweet potatoes. Using a spiralizer, make ribbons of potatoes or sweet potatoes. Place a single layer of potatoes in deep fryer basket. Moisture content of potatoes varies and will affect frying time. Watch potatoes closely while frying and remove when browned and crisp.